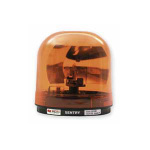 Federal Signal’s Sentry® halogen beacon is a reliable, effective warning light in an attractive, compact package. The large parabolic reflector and brilliant 55-watt halogen bulb combine to produce an intense 80,000 candelas per flash. The Sentry offers excellent 360-degree warning coverage with 95 or 175 flashes per minute rotators. For high vibration applications, an optional vibration mount kit can extend the service life of your Sentry beacon.